You can walk them on a leash, housebreak them and let them out to play in the backyard. However, they don't bark. Oinking is more their line. They're potbellied pigs, as smart a canine and a fairly clean animal, contrary to reputation. Owning a potbellied pig can be a rewarding experience, as long as you're aware of some of the common problems facing these pets. Before you bring home a pig, make sure your local zoning laws allow you to keep such a pet. If you live in a rural area, it might not be a problem, but don't make assumptions if you live in a city or the suburbs. If you're found in violation of local zoning ordinances, you will have to give up your pet and might be subject to fines. Think twice about keeping a pig in an apartment, even if you take him for frequent walks. Pigs need access to a fenced-in yard to root, a behavior you don't want to encourage in your living space. One common problem with potbellied pigs is that the animals grow far larger than their owners were led to believe. Don't be fooled by photos of pigs no larger than small dogs. They're piglets, not full-grown potbellied pigs. While potbellied pigs don't grow nearly as large as commercial hogs, the latter can weigh 800 pounds or more. Expect your potbellied pig to mature about the size of a large canine, between 120 and 150 pounds, according to Texas A&M University. They're more compact than big dogs, but the weight is similar. If you buy a young pig rather than adopt a mature animal, ask the breeder to let you meet the pig's mother and father to get an idea of how large your pet might turn out. Pigs will eat just about anything. That doesn't mean they should. Pig feeding problems fall into two distinct categories: overfeeding and underfeeding. People who feed their pigs too much end up with unhealthy, obese pets, prone to arthritis and other weight-related ailments. Some people underfeed their pigs in the mistaken belief too little food keeps the pig small. Malnutrition is never healthy. Feed your vet a food made especially for pet pigs, not commercial hogs. Feeds are manufactured for various pig life stages. Ask your vet about the correct amount of food for your pet. It's important to spay or neuter your potbellied pig. 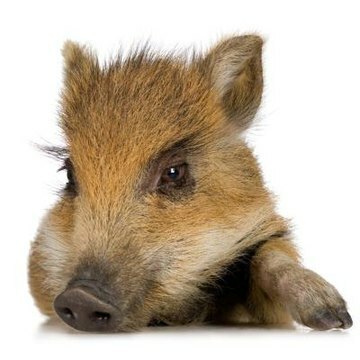 Once pigs hit sexual maturity, that cute little animal can turn mean and nasty, especially the boars. Males can father babies when only several months old themselves. Pregnant sows become very territorial. Spaying and neutering not only prevents many aggression issues, but keeps sows from developing uterine cancer and barrows -- the neutered males -- from testicular and other cancers common in intact pigs. Pigs and dogs generally don't mix. That doesn't mean your family dog can't get along with your porcine pet, but introduce them slowly and carefully. The bigger risk is attack by loose dogs. Fence in an area of your yard that keeps your pig in and dogs out. You also want to fence your pig out of your garden or anywhere you don't want him rooting, one of his basic instincts.